Nice Place with a pool! We were in a 4 bed dorm, really spacious with private bathroom, air con and a fan. Grounds of hostel are nice and breakfast is good! Town is quiet as it is a border town and people generally only stay here for a night or two either side of visiting the falls. Nice Place, good size rooms w/ bathroom and a restaurant.bar. 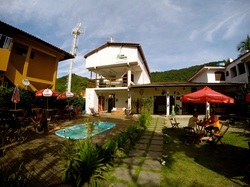 Hostel building is large and spacious with good wifi in the common area. Also breakfast is included and not had bad! Staff are friendly and helpful. Hostel also has walking tours and activities you can book through them. Good fun and not badly priced. Nice Place, good size rooms, personal lockers and very helpful staff. Hostel building is large and spacious with good wifi in the common area. Also breakfast is included and good! 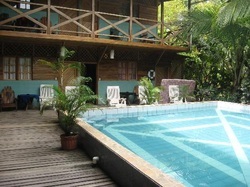 Hostel also has heaps of tours and activities you can book through them. Stay 4 nights and get a free days bike hire at hug's Bikes! Do it, it's so much fun. Nice Place, good size rooms, personal lockers and helpful staff. Hostel building is medium sized with a small TV room and nice outside sitting area and backyard. Breakfast is included but is only bread and jam, and the quality of bread is highly debatable. Hostel only gets 3 stars as a girl in the room next to us got bed bugs, not fun. Awesome place. 20m from the waters edge on Front street. 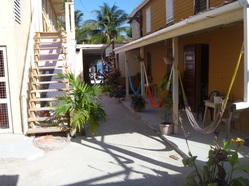 Hammock in front of every room, private bathroom with each room, free wi-fi, a BBQ and a shared kitchen. Location is close to the split, food vendors, bakery, bank, etc however the island is tiny so realistically everything is close! Washing was available upon request. Owner, Jim is nice, don't see him too much (other than when he caught fresh lobsters for us for lunch!) but manager Shehady (unsure of spelling) is awesome, she is such a caring and beautiful natured person. She really made our stay fantastic! No down sides! would definitely recommend Jermiah's Inn to anyone and everyone! Price: $50US for a 4+ person cabana on the beach. 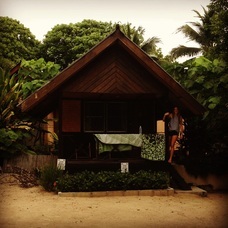 Cabana was nice, private bathroom and small deck overlooking beach and water out front. We only stayed one night but had nil complaints. Review based on room and location. Snorkelling day tour was great. Hot lunch meal, fresh fruit and rum drinks included. Visited 3 great snorkelling spots, all of which were nice. - Hol Chan Marine reserve → BEST BY FAR, beautiful snorkelling, with amazing coral and sea life. Island Hopping Cruise (2n/3d) was FANTASTIC!! DO IT! Unfortunately for us it rained during our cruise from Caye Caulker to Placencia, however it was heaps of fun anyway with sailing and snorkelling during the day and setting up camp at a new tiny island each night. The meals provided were incredible (lots of which was caught fresh by the crew each day) and the islands (Rendezvous Caye and Tobacco Caye) that we set up camp on each night were picturesque. Also plenty of rum provided. Raggamuffin gets 4/5 stars due to the prices, we felt that it was expensive for what we got comparatively to prices throughout the rest of Central America. However we would still recommend this company to anyone as it was a great experience and the tour's and food provided were great (just a little pricey). Che Lagarto is a well know chain through South America. 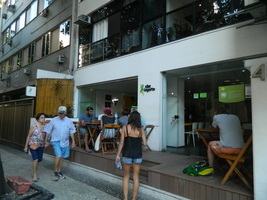 It was a fun hostel with a good atmosphere and bar (free caipirinha on arrival). GOOD location, 1 block to Ipanema beach. The staff were super friendly and most spoke english. There were not laundry and kitchen facilities that we saw however breakfast is included. The common room was too small/loud for the number of people, thus not really anywhere to chill out. Books was a really fun hostel. It had a great party atmosphere and was in close proximity to lot's of Lapa's nightlife (and the famed Friday night street parties). 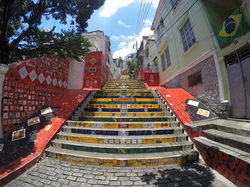 The hostel is also super close to the Lapa steps and all the necessary bus routes. The only negative about the hostel was that it was incredibly hot, but hey it's Brazil when it's hot it is hot! Would definitely recommend this hostel especially for those looking to party. 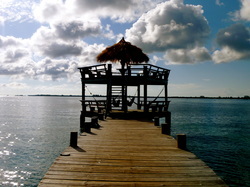 Breakfast is included and is eaten on a deck overlooking the lagoon. Perfect! NB: Very quiet hostel, if you're looking to party stay more up in the main town. Price: $25 / night for a 2 bedroom apartment w/ kitchen, bathroom, balcony and television. This spacious 4 person apartment was a great find!! Arraial is a small beach side town with many beautiful beaches. It is packed on the weekends with people making the trip north from Rio, however during the week it is fairly quiet. This apartment is ON THE BEACH at Praia dos Anjos and close to many restaurants, tour companies, dive schools, acai stalls etc. It was a nice hostel with breakfast included. We stayed in a 6 person dorm and it was not too small. 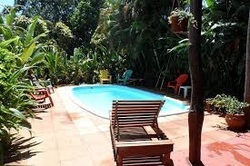 GOOD location, on water, short walk to Abraão village w/ many restaurants, tour companies etc. There were not laundry facilities that we saw. Wi-fi would drop out some days but that is to be expected on an island. Nil complaints! I would definitely recommend this however I would say stay in a 6 or less bed dorm as the 10 bed dorms can be a little hectic. It was a nice hostel with breakfast included. We stayed in a 10 person dorm and it was not too small (much bigger than the 10 person room we had with this chain in Ipanema). Good location, short walk to multiple beaches and stores. The staff were super friendly and most spoke a little english. It was a nice hostel with breakfast included. We stayed in a 6 person dorm. 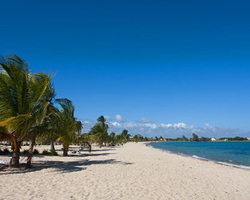 Good location, short walk to historical centre, beach, restaurants and stores. 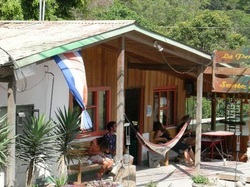 Barra Surf was a super friendly, family owned and run hostel a 2 minute walk from the beach. It was a nice hostel with breakfast included and the breakfast was nice. It is also a short walk to convenience shops and restaurants. Andes was great! It is located in Bella Artes and is RIGHT ACROSS from the metro that can take you to all parts of the city. Good size rooms with lockers. Nil complaints, would definitely recommend to all fellow travellers. Nomada was a nice old style home renovated into a hostel. Location was good, staff were friendly and the rooms and bed were huge! Location was good, staff were friendly and the rooms and bed were comfortable. Breakfast wasn't included included however they have a fully equipped kitchen. Wouldn't recommend to people who don't like cats as there are lots of them in the backyard. 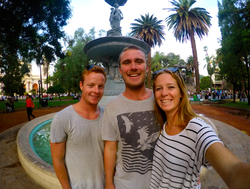 We booked this tour through our hostel in San Pedro de Atacama, Chile and had a great time! The drivers were safe, the food was amazing and the accommodation was comfortable. 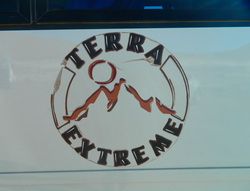 You can definitely do this tour for less $$$'s, especially if you do it from the bolivian side, however it is very important to check the quality of the cars used and the drivers. 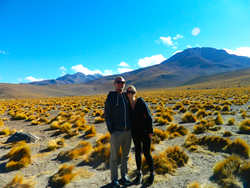 We booked 2 tours with this company through our hostel in San Pedro de Atacama, Chile and had a great time for both tours. The drivers were safe and the guides were knowledgable. Great hostel atmosphere. Large shared kitchen with fridge (and space to store your food). We had a big room (with 2 or 3 beds), large back garden area to sit in the sun or pitch a tent. Dormitory and private options. Owners are nice and prompt at replying to emails! 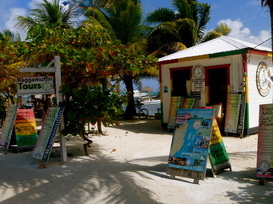 Really close to the bank, bakery, local restaurants for great cheap tipico feeds! Rocking J's was an great looking hostel with colourful mosaic art covering most (if not all) of the walls around the place and beautiful, waterfront lush green gardens . 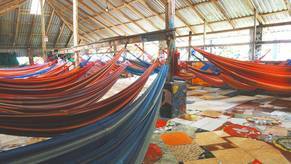 It was a combination of hammocks, dorms, private rooms and tents. No complaints on the grounds and hostel layout, that was amazing. However this being said we found it quite expensive for what we got (a 2x2m tent surrounded by 50+ other tents with less than a metre between them), the staff were quite unwelcoming and the place was really loud at night, as it was all open. Resultantly we would recommend it to single travellers, or those looking for a party atmosphere. Price: $45US for a double private room with bathroom and breakfast included. Nice place, a little quiet. Not many (if any) other visitors when we were there. On main strip very close to stores and restaurants. Free wifi and a great restaurant in front of hostel, tasty breakfast included in price. Pool is always nice for a dip! 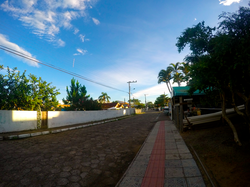 Hostel location was good (Flores is tiny so everything is close). Rooftop patio overlooked lake. Room had 2 single beds and private bathroom. Shower head had electric hot water heater attached, both of us were shocked by system, seemed quite dangerous. Didn't deal with staff very much. Only stayed for 2 nights, nil complaints. 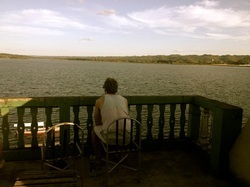 We were only here overnight as we missed the last ferry to Utila. However it was really well priced and the staff were nice and helpful. Our review is based on the price and the quality of the room. Nil complaints, would recommend to anyone in La Ceiba for the night. The atmosphere was really fun as there were a lot of 'permanent' travellers who were completing their dive masters. We had a room with 2 single beds that opened up to a balcony looking on to the water, it was beautiful. Bathrooms were shared and there was limited hot water (as usual on smaller islands). 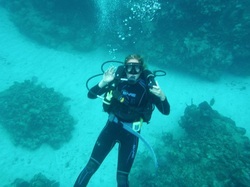 Really professional and knowledgable dive staff, the course was really interesting and really well priced. Visited multiple dive sites including The Haliburton ( a shipwreck at a depth of 35metres) and dove at night time. Really amazing dive locations! Would DEFINITELY recommend Alton's to anyone interested in diving. 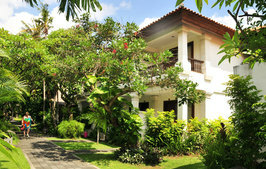 Located beachfront in Legian, Nice hotel, 2 good pol areas (one with a swim up bar). Good room size. Legian is getting a little too crowded and touristy for my liking but none the less this is a great place to stay as a couple, group of friends or family. EXPENSIVE comparatively to our usual accommodation, but very, very nice. 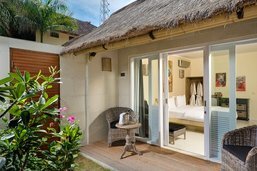 Located along the main street on Gili Trawangan Scallywags is a very nice boutique hotel. Private pool and restaurant are nice. Room is good size and bathroom is stunning (indoor/outdoor). 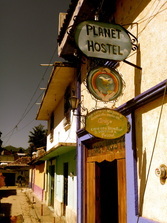 Brightly painted rooms with clean shared bathrooms and hot water showers (at times). Included breakfast was basic but good - toast, fruit, coffee etc. Wifi included, can buy beers from front desk. Cool little courtyard out the back and comfy chairs in the common areas. We were able to book a van trip to Palenque from the front desk via Agua Azul and Misol Ha - pretty sure this was available from most hostels in San Cristobal. Price: $15US for a private double room. The double room was nice but really dark. We had a hammock out the front of our room (always a bonus). The shared bathrooms were clean and there was warm water. There was also a giant bird cage out the front of the bathrooms filled with all kinds of tropical parrots. Pretty cool. Wi-fi included - was really slow. Grounds of hostel were nice, there was a garden with chairs and also a fire pit. Nice to chill out in. Price: $35US for a private room with a bathroom and breakfast included. 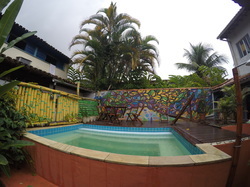 Great hostel, large room with double bed, private bathroom and small balcony. Downstairs area with table, hammocks and boardgames. Restaurant attached down the bottom - Indonesian food. Location is great as most of the places in Boca's Town are, everything is very close. Would definitely recommend it to fellow travellers. Amazing Hostel, the owners Luis and Theresa go out of their way to help you out and make sure everything's perfect! Great big rooms and hot showers... With pressure! (a rarity in most hostels). Rooms have fans and air con if you really need it. Kitchen is great, better than ours at home! And there is a pool! We had an early flight home in the morning and Luis dropped us at the airport himself bright and early. Would recommend this to anyone visiting Panama city! Price: $35 for double room, with bathroom and air con. Breakfast included. 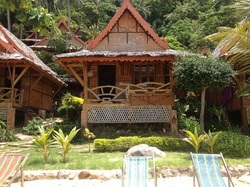 Nice place to stay after a late arriving flight (or before an early leaving flight) as very close to Phuket airport. Had a little walk around the area, didn't seem to be lots to do but we were only there for 1 day and 1 night. 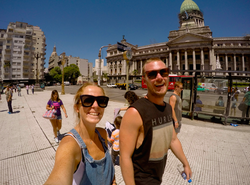 Also with an airport transfer fee of only $6 AUD we were very happy. 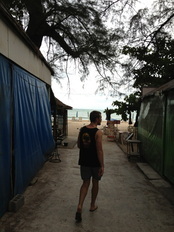 Photo is of a Sean heading down track to beach across the road from the hotel as we didn't get any photo's of the hotel. Price: Inclusive with diving! Self contained cabana, with bathroom. Great if you can take the heat! Super cheap and a stones throw form the waters edge this was a perfect place for us to dump our bags, however it did get very hot at night (ceiling fan doesn't do too much when temperatures are above 30). We got the room cheap with our boat dives and were very happy with it. Only reason it gets 4 stars and not 5 is that the windows in our cabana didn't open so resultantly we got no cross ventilation, otherwise it was perfect, would definitely stay again! P.s. 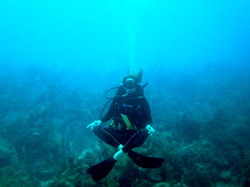 Very professional diving school! Check it out! Price: $30 for private room, big bathroom and air con. Arrived late and left early, only stayed for one night as we had a ferry booked back to Phuket the next day. Nice hotel, great rom and beautiful bathroom! Staff came across as quite rude and at first "couldn't find" our prepaid reservation (made through expedia), so that was a small negative, however it could have been a language barrier too. Otherwise nil complaints! Rating based on room and hotel premises alone as we didn't visit the surrounding area. Would stay again. Price: $50ish for a double room with a balcony and private bathroom AND breakfast included. Rooms had aircon. Pool with bar. Beach front restaurant. Very nice accommodation, a little more than we need usually when staying somewhere as we're not in our room much, however it was very nice! BEAUTIFUL, BEACH FRONT CABANA!! Snorkelling, hammock and rope swing right out front of our cabana. So pretty and very quiet Very nice friendly staff. A great place for our last night in Thailand. Wi-fi available at restaurant (very slow). To access you need to catch a boat around from the main beach on Koh Phi Phi. Our reviews are based from our experience(s) at the time, and may not be reflective of the places and companies in present day. Make sure you always do your own research into any travel destinations and companies you plan on booking with. Reading too many reviews is never enough and be cautious of extremely negative reviews on hostels (or other budget accommodation) as some people do not understand the idea of cheaper places (what you expect to get and what you don't) and thus will give a place a terrible rating when it isn't bad at all!! Be wary as a business' rating can be severely damaged by one bad apple (and some people leave seriously bad reviews for no reason, there is some crazy people out there)!